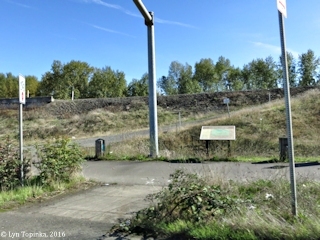 "Vanport and the 1948 Vanport Flood"
Click image to enlarge Oregon History sign, Vanport, located at the Vanport Wetlands Dog Park, Portland, Oregon. Image taken July 6, 2016. At one time Oregon's second largest city existed between the Columbia River on the north, the Columbia Slough on the south, Denver Avenue (Interstate 5) on the east, and the Union Pacific Railroad Tracks and Smith Lake on the west. 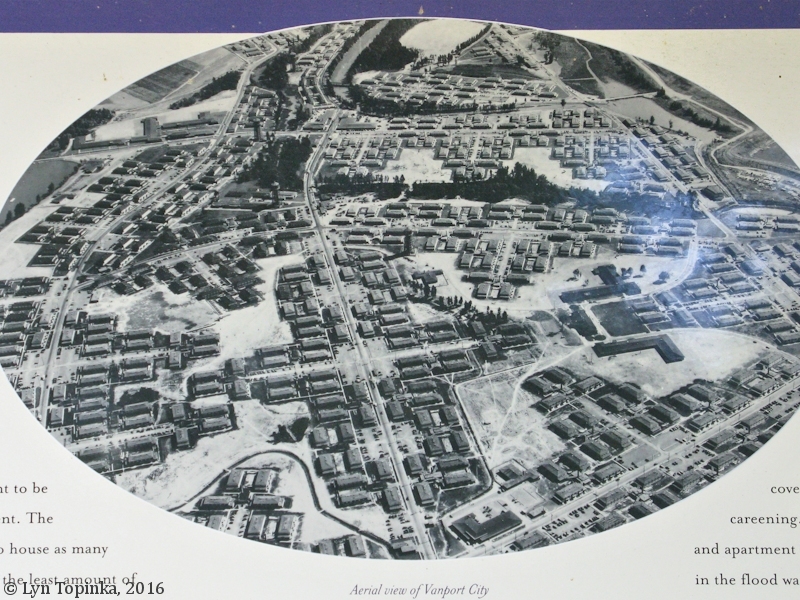 This city was called "Vanport" or "Vanport City", a name derived from the two cities on either side of it, Vancouver, Washington and Portland, Oregon. 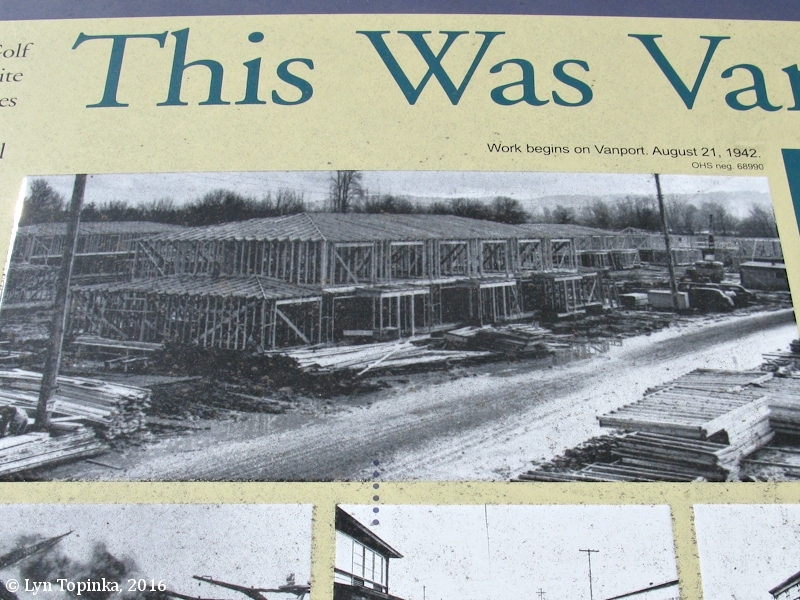 The construction of Vanport began in 1942 as temporary housing for World War II workers in the shipyards, and often was referred to as "Kaiserville" after Henry Kaiser, owner of the areas largest shipyards. The city was built on the floodplain of the Columbia River and was protected by levees and dikes. The Vanport Post Office was established on April 22, 1943. On May 30, 1948, Vanport was destroyed in the second largest flood in recorded Columbia River history. The Post Office was officially closed on June 30. Today the area which once was Vanport is the location of the Portland International Raceway, Huron Lakes Golf Course, Force Lake and the Vanport Wetlands Wildlife Habitat area. 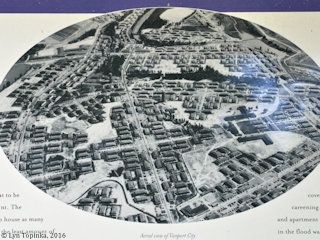 The Vanport area is part of Portland's historic Kenton District. A warm May in the spring of 1948 resulted in rapid snowmelt in the Cascades and rising waters of the Columbia River. By May 25, 1948, both the Columbia and the Willamette Rivers were nearly at 23 feet, eight feet over flood stage. On May 30, 1948, at approximately 4:17 p.m., the railroad dike between Smith Lake and Vanport gave way. Within moments a 10-foot-high wall of water rushed over lands north of the Columbia Slough and inundated the city of Vanport. 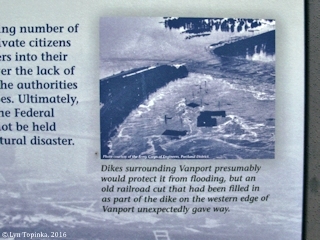 Fortunately sloughs within Vanport absorbed the initial surge, allowing approximately 40 minutes for most people to flee Vanport to higher ground along Denver Avenue. Fifteen lives were lost and Vanport was gone forever. 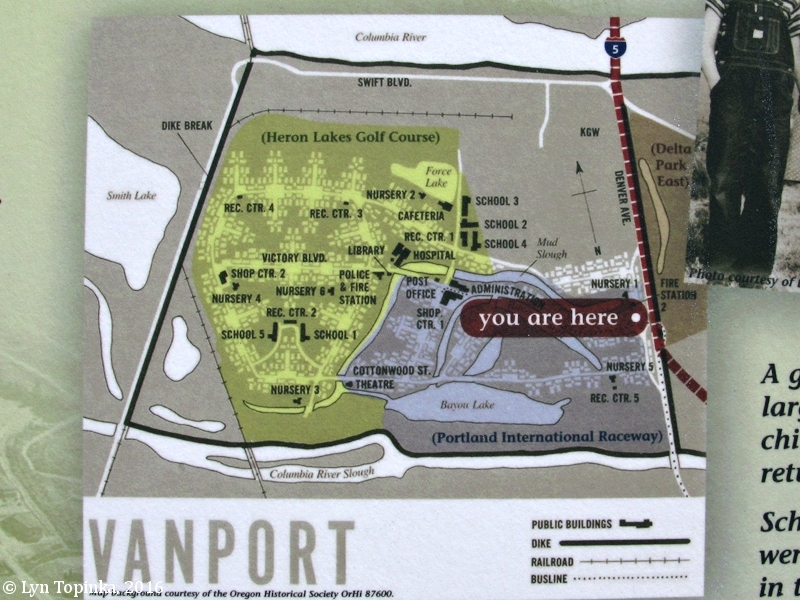 Today the area which once was Vanport is now the location of the Portland International Raceway and the Huron Lakes Golf Course. 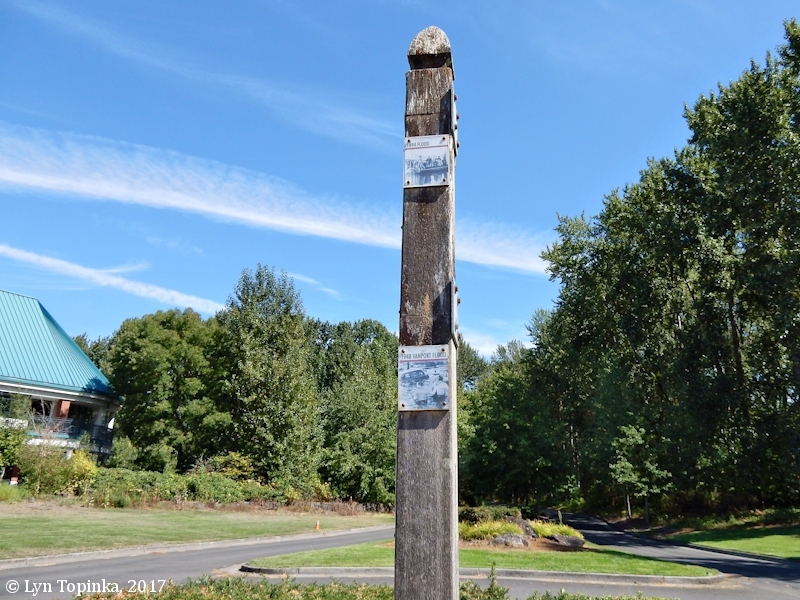 Click image to enlarge Detail, Oregon History sign, Vanport, located at the Vanport Wetlands Dog Park, Portland, Oregon. Image taken July 6, 2016. 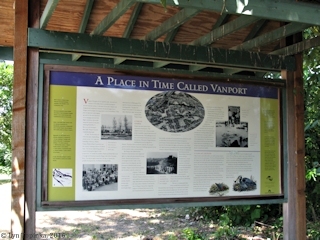 Information signs about the history of Vanport and the 1948 Vanport Flood exist at the south side of Force Lake and the Heron Lakes Golf Course. 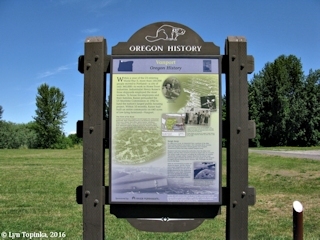 A "Oregon History" sign about Vanport is located at the Vanport Wetlands Dog Park. "Within a year of the US entering World War II, more than 160,000 people moved to Portland -- a city of only 360,000 -- to work in Home Front industries. Industrialist Henry Kaiser's three shipyards employed the most workers. To house his employees and their families, Kaiser persuaded the US Maritime Commission in 1942 to fund the nation's largest public housing project. Within 10 months, Kaiser had built an entire community on 640 acres of low-lying farmland -- Vanport." "Vanport soon became Oregon's second largest city, nicknamed Kaiserville. Most Vanporters lived in one-bedroom apartments. There was a library, post-office, police station, infirmary, public cafeteria, stores, and a 750-seat movie theater. While most Americans had no medical insurance, Kaiser's workers enjoyed a prepaid health plan. After the war, the plan and its doctors became the Kaiser Permanente medical and dental care program." "In 1948 at 4:17 p.m. on Memorial Day, a portion of the dike surrounding Vanport was broken. The Columbia River, swollen with early spring snowmelt, flowed quickly into Vanport. Floodwaters fifteen feet deep washed Vanport away. Residents had been assured by authorities that the dikes were holding and that they would be warned in ample time to evacuate. The break caught everyone, including the authorities, by surprise. Thankfully, sloughs within Vanport absorbed the initial surge, allowing approximately 40 minutes for most people to flee Vanport to higher ground along Denver Avenue. Still, 18* people lost their lives in the flood." * Note: The Oregon Encyclopedia says there were 15 deaths and other sources say 16. Source: Oregon History Sign, Vanport Wetlands Dog Park, Portland, Oregon, visited July 2016. 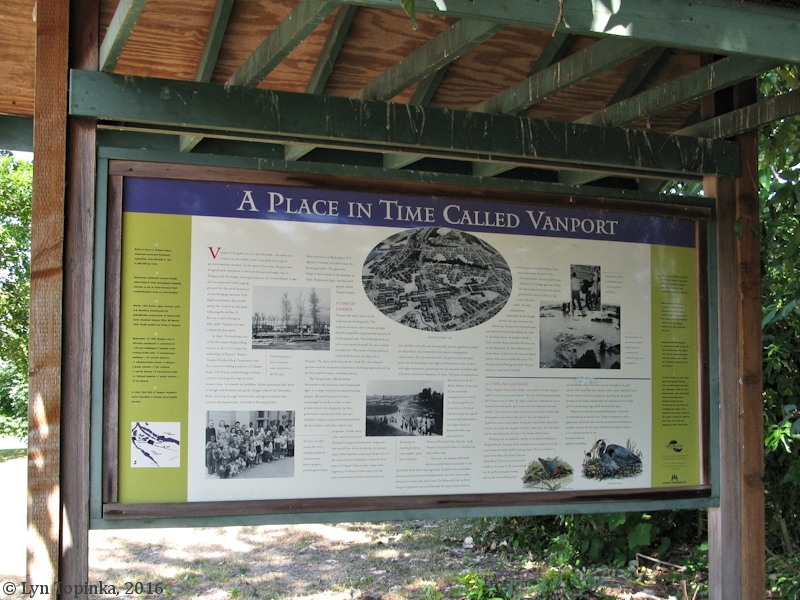 Click image to enlarge "A Place In Time Called Vanport" ... Vanport information sign, Force Lake, Portland, Oregon. 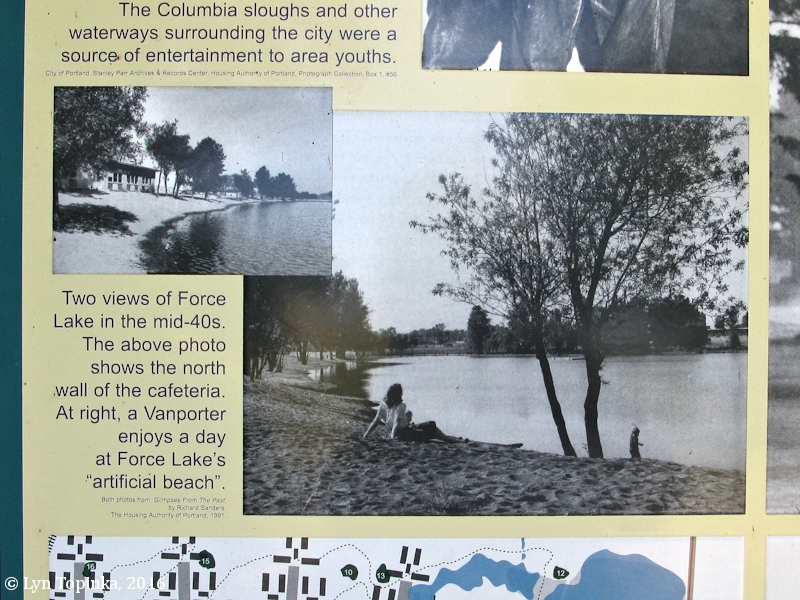 Double-sided sign (western side shown here) located on the south side of Force Lake. Image taken July 6, 2016. 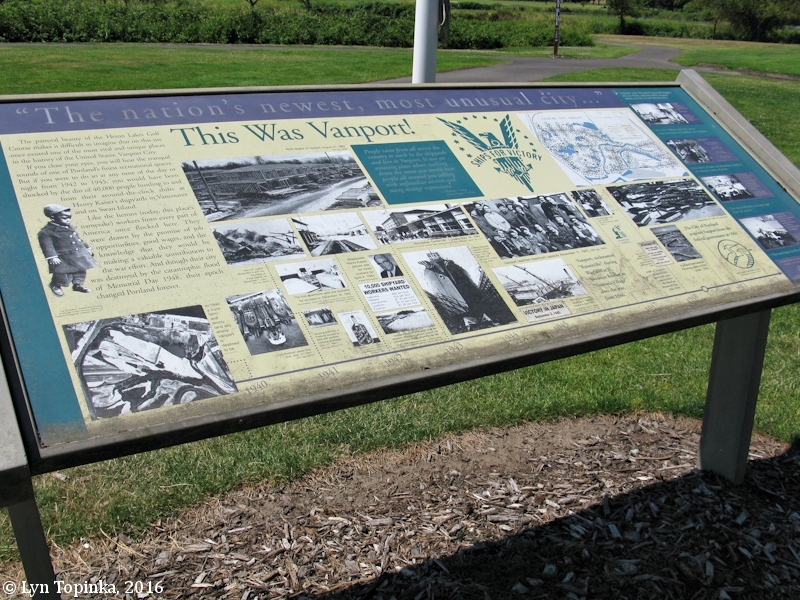 Click image to enlarge "This Was Vanport" ... Vanport information sign, Heron Lakes Golf Course, Portland, Oregon. 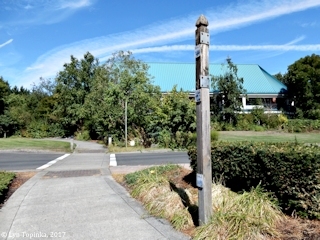 Sign located near the clubhouse of the Heron Lakes Golf Course. Image taken July 6, 2016. 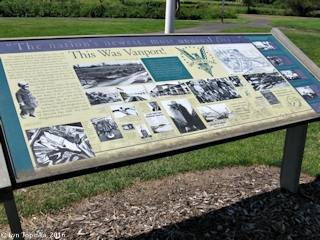 Click image to enlarge "Vanport" ... Oregon History sign located at the Vanport Wetlands Dog Park, Portland, Oregon. Image taken July 6, 2016. Click image to enlarge Construction of Vanport ... Vanport information sign detail, Heron Lakes Golf Course, Portland, Oregon. Image taken July 6, 2016. 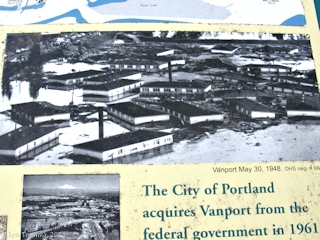 Click image to enlarge Aerial Vanport City ... Vanport information sign detail, Force Lake, Portland, Oregon. Image taken July 6, 2016. 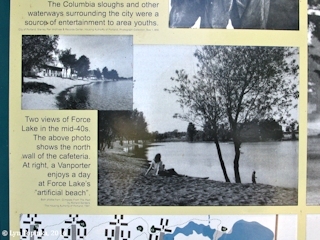 Click image to enlarge Force Lake in the 1940s ... Vanport information sign detail, Force Lake, Portland, Oregon. Image taken July 6, 2016. Click image to enlarge Railroad cut breach ... Oregon History Vanport sign detail, located at the Vanport Wetlands Dog Park, Portland, Oregon. Image taken July 6, 2016. "Dikes surrounding Vanport presumably would protect it from flooding, but an old railroad cut that had been filled in as part of the dike on the western edge of Vanport unexpectedly gave way." Click image to enlarge Location of where the dike breached, Vanport Flood. View from moving car heading north. Image taken October 12, 2016. 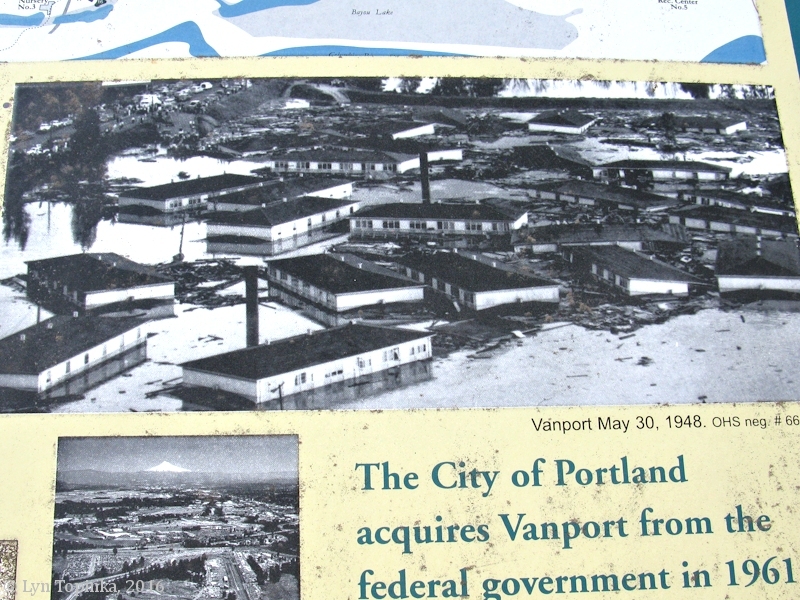 Click image to enlarge Flooded Vanport ... Vanport information sign detail, Heron Lakes Golf Course, Portland, Oregon. Image taken July 6, 2016. "The river's all-time crest [Columbia River], 31 feet, occurred on June 13, 1948, two weeks after the start of the Vanport Flood. The flood deluged the now-abandoned community of Vanport with as much as 10 feet of water. Vanport, which at the time was Oregon's second largest urban community, was destroyed and 15 people were killed." Before complete records were kept, the Columbia River reached an estimated 34.4 feet on June 7, 1894, during the Great Flood of 1894. That river level would be high enough to cause widespread flooding in downtown Vancouver." Source: "clark.wa.gov" website, 2018, "Clark County Flood History". 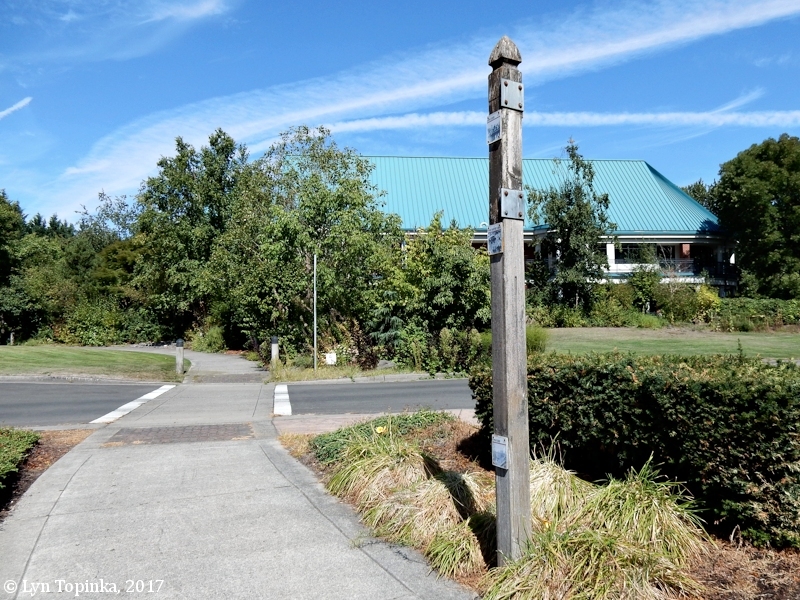 Today, Vancouver, Washington's Water Resources Education Center, located upstream of Ryan Point and downstream of Wintler Park, has a staff gage on its property showing the high water marks of the 1894 "Great Flood", the 1948 "Vanport Flood", and the 1996 Columbia River flood. Click image to enlarge High water marks, Water Resources Education Center, Vancouver, Washington. Image taken August 30, 2017. Upper sign: "1894 Great Flood" ... Middle sign: "1948 Vanport Flood" ... Lower sign: "1996 Columbia River Flood". Click image to enlarge 1894 and 1948 high water marks, Water Resources Education Center, Vancouver, Washington. Image taken August 30, 2017.